Justice League of America: Road to Rebirth collects the five specials that bridged Justice League vs. Suicide Squad to the new series -- Atom, Vixen, Ray, Killer Frost, and Justice League of America itself. Of these, only one truly introduces a brand-new character, and the League issue is included also in Justice League of America Vol. 1: The Extremists. To that end, in mostly telling stories that don't establish anything new or retread old ground, Road to Rebirth doesn't impress to the extent it could. I might've just preferred writer Steve Orlando integrate all of this into the first storyline or just get on with it and tackle how the group came together later. Road to Rebirth ought have made me eager for the first true volume, but instead just made me impatient. It is perhaps to Road to Rebirth's credit that these specials are not so much about heroes fighting villains but rather simply about establishing the personalities of these heroes. The Atom story has about no conflict at all, except new Atom Ryan Choi gaining his own confidence; the Vixen, Ray, and Killer Frost stories' fights are limited to a page or two, and the Justice League special is mostly the heroes sitting around talking. This emphasis on conversation would generally be welcome, and that Orlando has the team come together not to fight some common threat but because Batman specifically recruits them all is a fun deconstruction of the way stories of this type usually go down. But given that the Atom special has no real conflict, and among the most important parts is a re-do of a scene from DC Universe: Rebirth, makes one wonder whether it was necessary at all and if the story offered anything we didn't already know. The Killer Frost story, in a similar way, mainly restates the Frost/Amanda Waller feud that readers of Justice League and Suicide Squad are already familiar with. It's further problematic that despite both Atom Ray Palmer and Vixen Mari McCabe's extended presence in the New 52 (and Batman professing a familiarity with each), these books don't coincide well with established continuity; everything that's old is neither new nor old again here, and so it makes it tough to get a handle on or really feel for these characters. The "newest" of the stories is the welcome reintroduction of Ray Terrill to the DC Universe after some years' absence. That the book served as an actual origin was good, and of course Jack Harris and Joe Quesada's Ray costume is among the all-time best. But the story falls apart in the details -- that Ray's mother is almost monstrously cruel to her ill son; that bizarrely she seems to have no contact with the outside world including no phone that could tell her the fate of a playmate that Ray injured; that after a time lapse of ten years, Stephen Byrne draws the mother wearing the exact same clothing as she did earlier; and that in another strange time jump, it becomes very confusing whether Ray has been invisible for half a decade or not. Orlando is a writer whose work I enjoyed on Midnighter, for instance, but the whole book is peppered with these off moments -- that a talk show host interviewing Mari didn't know the child they invited to participate would tell Mari off, that Batman doesn't know Ray Palmer has been missing for weeks, and so on. What mostly interests me here is Batman-via-Orlando's construction of this new team, imagining it as a team of "mortals, not gods" that demonstrates that "heroism is a community." This -- plus the variety of races, nationalities, and sexual orientations on the team -- suggests a League that meets a certain cultural zeitgeist, and I'm interested to see Orlando explore that in a way that mainstream rival Marvel has historically done better than DC. At the same time, a Justice League "of the people" is hardly a new concept -- see the last Justice League America, plus Extreme Justice, part of Justice League Task Force, Justice League Europe, and so on -- and never have these groups had much more staying power than the Justice League proper. I'm not wholly convinced the market supports multiple Justice Leagues, and I fear Orlando's team ending up a "Justice League footnote," too. 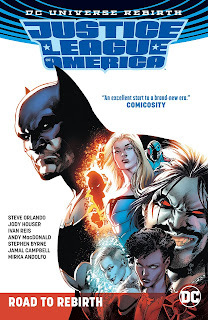 Obviously at least one thing this team has going for it is the television presence of five of its seven members; "Justice League of America" is a title that will probably sell better but this could almost have been called DC's Legends of Tomorrow. Fortunately Orlando and company aren't letting themselves get too bogged down, feeling confident to use virtually unrecognizable versions of most of these characters as far as the CW shows are concerned; at the same time, I think for sure Orlando and company ought lean in to this. Firestorm would be an easy, tonally appropriate addition to the team, as would Wild Dog; a crossover with Flash, Green Arrow, or Orlando's own Supergirl (itself modeled after the TV show) would be a joyful wink and nod. Ivan Reis anchors Justice League of America: Road to Rebirth well on art, though it doesn't appear he's sticking around very long. There's no poor art here, but aside from Reis I liked the rounded, more animated art of Andy MacDonald, Byrne, and Mirka Andolfo versus Jamal Campbell's realistic work (though suited as it was for the Vixen chapter). On one hand I would worry a lighter approach wouldn't necessarily be what readers want from this book; on the other hand, something like MacDonald that's not quite DC's house style might be appropriate for this team's lineup. In this prelude volume, Steve Orlando doesn't quite show us what he's got yet; I'm hoping for stronger things next time around.